There is a strange problem i am facing is that, i am no longer able to log in to my account either by going into Norton interface main window or either the identity safe vault. It is giving me an error of "Fail to sign". I have done fresh install of Windows 8.1 Pro Latest Updated and Norton IS 2014 latest updated. Have you tried talking with customer support to see if they can help? No, i did not try the chat option, but Norton repair option also could not correct it and nor the removal/uninstall/Norton removal tool. However i have reinstalled my Windows, so lets see what happens. I'm having EXACTLY the same problem, and for the past 3 days now. I am unable to sign into my Norton Account via the Internet Security panel, opened from the icon in my taskbar; and, I am also unable to sign into my Norton Account via the Identity Safe portal on my browser's taskbar. This happened suddenly, about 3 days ago, presumably after Norton liveupdates were run. When I try to log into my Norton account via the Norton Internet Security panel, I also get a red "X" and the message "Failed to login", just like silverhawk. However, when I go to the Norton webpages, I am able to log into my Norton Account with no problem, and on the Norton Identity Safe web page, my logins are still there. That's why I know there is a problem with Norton, not with my login credentials. A Norton tech representative took remote control of my computer yesterday for 3 hours (!) and was unable to fix the problem!!! Of course, while this problem exists, I am unable to use Identity Safe in my browser and therefore unable to take advantage of "automatic" logins. I am so frustrated with Norton at this point in time that I'm considering switching to another anti-virus program AND another password manager. First was the fiasco with Chrome version 32, because Norton had not heeded Google Chrome's advice to update the way in which Identity Safe interacted with Chrome. Now this. I've about had it with Norton! What operating system is your computer running? I'm running Windows 7 service pack 1. As I mentioned, this only started 3 days ago. Prior to that, no problems signing into my Norton Account. Since I'm able to sign in via the web, it's almost like the sign in function via the Norton Internet Security main panel, accessed via the Norton icon in my taskbar, is not reaching the Symantic servers. As I also mentioned, a Norton tech took over remotely my computer for 3 hours yesterday and was unable to fix the problem. She said that she would write it up, however. Sounds more like a server glitch, since you and the OP are having the same problem on machines running different OS's. That's what I think, too. When I try to sign into my Norton Account via the Identity Safe button on the Norton Toolbar in my browser, I enter my email address and then, instead of prompting me for my password, it just hangs upon entry of my email address until I stop it. No help from Norton, however, at least not yet; and, the Norton tech yesterday seemed to be unaware of any problem on their part. It HAS to be something with their servers OR a liveupdate patch that's interfering - nothing else makes any sense. Anyone else getting this sign-in error? (See the other two posts for details). Norton: Any help on this????????????????? I have been seeing a similar but slightly different behavior since updating to NIS 21.2.0.38. On my Win 7 SP1 32 bit pc, I can sign-in or sign-out of my Norton account using the sign in box on the NIS panel main page immediately after booting my PC and logging in to my Windows account. But after an unknown time (less than an hour) I can no longer sign-in or sign-out using the sign-in box. If I try to either sign-in or sign-out of my Norton account after having been up for a while, I get a progress bar that never completes. I have let it run for up to 5 minutes before shutting it off. A sign-in or sign-out usually takes a few seconds. I have never received the error message reported by others. A. Log off of my Windows account and re-log back into my Windows account. The sign-in box works immediately after re-logging in. I do not have to reboot the pc. B. From the NIS panel I can navigate to Settings>Web>Identity Safe>Configure and login or logout of my Norton account and ID Safe at any time. C. From my browsers (FF 28 and IE 11) I can use the Norton Toolbar (2014.7.0.43) to login to my Norton account and ID Safe at any time. Another observation. The sign-in box on the main panel always displays the current sign-in status: signed-in or not signed-in. I just cannot use the box to change that status after an hour or so of activity. I have a 2nd PC running Win 7 SP1 64bit which has never displayed this problem. OK, going to try this again, with a picture this time. When I try to sign into my Norton Account via the Norton Internet Security main screen (opened via the Norton IS icon in my taskbar tray), I get the message "Failed to Sign In" with a big, red "X". I'm attaching a screenshot of the error message. I know that I'm entering my correct email address and password because I'm able to sign into my account via the Norton webpage with no problems! A Norton tech took over remotely control of my computer for 3 hours yesterday and was not able to correct the problem. My inability to sign in via the Norton IS main screen means that I cannot setup Identity Safe in my browser (Chrome version 33). The Norton tech removed Norton IS using the Norton Removal Tool and reinstalled it 2 different times yesterday, and I did that a 3rd time today. Nothing corrects the problem. I need help! Any ideas??? My computer is an HP Pavilion g7 running Windows 7, SP1. This started only 3 days ago; hence, I'm thinking that there is something preventing access to Symantics servers (although, as mentioned, I have no problem signing into my account via the web). It is showing I think because I have autologin set to ON in IE 11 but only authorize it for a small number of non sensitive websites eg my community library which has an ID consisting of about 12 digits form my membership card! I'm reluctant to turn off autologin since it saves me a good deal of time on nonsensitive sites and I prefer no to use Identity Safe. After I upgraded N 360 to 21.2.038, I went to a sign-in page (maybe it was the one on this forum), and noticed that upon entering my username, the password field was automatically filled in with a password that was 4 characters long (too short to be any of my passwords). Stranger still, Identity Safe wasn't even set up on my computer, as I don't even trust Norton to manage my passwords. I'll give them out when they pry them from my cold, dead hands! Interestingly, though, this has happened only once. I am seeing something similar to your issue of not being able to sign out of the Norton Account via the main NIS screen. I left the Sign out notice for over 5 minutes and when I click anywhere else on the screen, that message dissappears and I am still signed in. I guess that, thus far, Norton is not listening to anyone on this post (NOT unusual in my own experience!). I checked this morning and still the same problem: I'm not able to sign into my Norton Account via the main Norton Internet Security panel opened with the Norton icon in my taskbar tray. However, I can go to Norton's webpage and sign into my account with no problem. Of course, this means that I'm not able to sign into Identity Safe on my browsers either. And to think I pay good money every year for this type of (lack of) service from Norton! I've noticed something else that may give a clue to what is going on here: The first time that I boot up and try to sign into my Norton account via the Internet Security panel opened with the Norton icon in my system tray, I get the message, "Failed to log in" and the red "X". However, if I go about working on my computer for some time and then go back to the Norton IS panel to again try to sign into my Norton Account, what happens instead is that I get the message "Signing In" and it goes into an endless loop that continues until I stop it. This is consistent behavior when subsequently trying to sign into my account. Don't know if this observation will help diagnose the problem or not. I also have been able the duplicate the unable to sign-out of my Norton Account via the main GUI and have requested Norton have a look into the situations reported in this thread. The first 2 seem to be related - are the folks who reported them still having the problem? It would help for you to 1) identify the issue you're having (clear descriptions help) and 2) provide some steps to help us reproduce the issue. Did you update to 21.2 via LiveUpdate? Fresh install? Any details would be helpful. For the login issue, that seems unrelated - unless you're having the other issues as well. Can you provide any more details? Do you have multiple logins saved for that page? Are you able to login with the password provided by Identity Safe? Thanks for your help on these issues. I'm also unable to sign in to my Norton Account” from within my NIS 21.2, updated via LiveUpdate. The access window will disappear if I hover over it. If I don’t close NIS GUI, and try signing in again, clicking “Access” brings up the above window with my email address already entered, I add the password and all starts over again. If I close NIS GUI, and reopen it, clicking Access brings up the window without my email address already entered. I don’t use Identity Safe. I, however, experienced it just that one time. So it's fine here. And no, I don't use Identity Safe, either--it's not set up. I've already provided details in my previous posts on this subject. Yes, I'm still experiencing the problem of not being able to log into my Norton Account via the Norton Internet Security panel that I open with the Norton IS icon in my tasbar tray. If I open the panel and try to login immediately after booting up my computer, I get the large red "X" and the message "Failed to login". If I try again later on in my computer session, I then get the messge "Logging In" and it goes into an endless loop until I stop it (never logging in, however). I know that my login credentials are correct because I have no problem logging into my Norton Account on the Norton webpage via my browser. I do use Identity Safe, however have been unable to configure it for my browser since I can't currently login to my Norton Account via the Norton IS panel, and although I can log into Identity Safe via the web, it will not then autofill logons. As metnioned already, a Norton tech took over remote control of my computer three days ago and was unable to correct the problem after 3 hours of working on it. During that time, she removed Norton IS using the Norton Removal Tool and re-installed it; and, yes, I am running the current version of Internet Security. I do use Identity Safe, however have been unable to configure it for my browser since I can't currently login to my Norton Account via the Norton IS panel, and although I can log into Identity Safe via the web, it will not then autofill logons. 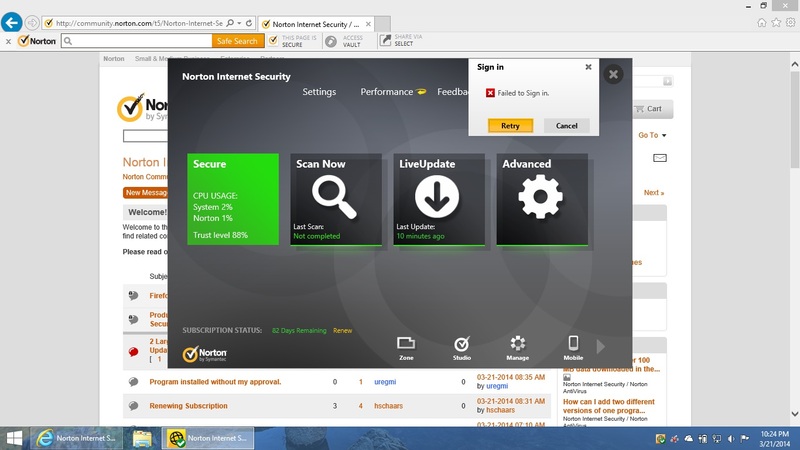 Have you tried logging into your Norton Account and ID Safe via the Norton Toolbar? I am seeing a similar problem as you but can log into ID Safe via the Norton toolbar using FF 28 or IE 11. Click on the button in the Norton Toolbar that says "Vault is Closed". Doing this allows me to log into my Norton Account and ID Safe. Also I can navigate on the NIS panel to Settings>Web>Identity Safe>Configure and log into my Norton Account and ID Safe. Autofill then works from both of my browsers. Yes, I have tried to log into Identity Safe both ways: ie, via the Norton toolbar in IE and via the Identity Safe dialogue under the "Web" section of the Norton Internet Security panel. What happens in both instances is I enter my User ID (email address) and then I get the message "Logging In" and it goes into an "endless loop", never prompting me to enter my password. The loop continues until I manually end it. Both of these methods of logging into the Norton account and ID safe that fail for you are working fine for me. Also, I have never seen the error message or red "x" that your report when using the sign-in box on the NIS panel. In fact, when I I first log in to a Windows user or admin account, I can use the sign-in box on the NIS panel with no problems. What I am experiencing is that after an unkown time, I get the "endless loop" circular bar that never completes, as you and others have reported. For me, logging out of my windows account and re-logging back in, resets things so I can use the sign-in box again. Of course it fails again after a period of time. There are multiple issues here or multiple manifestations of the issue. Agreed, and it has got to be a Norton problem. The problem logging into my Norton Account only began last week. It's very frustrating, especially so quickly after the Norton / Google Chrome fiasco! Still broken... still can't sign into my Norton Account via the Internet Security panel... still therefore can't setup Identity Safe again on my browsers. Looks like Norton is leaving us to our own devices...... once again! This is "deja vue" vis-a-vis the Norton/Chrome debacle, all over again. I guess Norton does not feel that we have a choice when it comes to password managers and antivirus software. Thanks for the update, pvmikey. And I'm assuming you've already contacted our customer support agents about this issue, right? For others on this thread, are you still experiencing it? I've heard mixed reports, and I want to figure out the reality of the situation. Yes Tony. I am still not able to log into Norton Account through the GUI. It did work for a short time today but then stopped again. I am able to log into my online vault and then the main NIS GUI shows I am signed in. It doesn't matter if I uncheck the Remember me box .... it comes back checked on the next boot. If I delete the inserted password it comes back again. Looks like I need to know how to request a new passsword? Tony, Yes I am still seeing the same problem behavior. I can use the sign-in GUI on the NIS panel just after I have logged into my windows user account. I can sign-in/sign-out, no problem. This works for about 10-15+ minutes. But after a while ( >15 min and < 1 hour after I have brought my windows user account up), if I try to use the sign-in GUI, I get the circular progress indicator that never completes and the status does not change. I can get into ID Safe and my Norton account via the Toolbar. The GUI then shows the correct status. Similar to what peterweb is reporting. Actually it did work the first time I tried signing in after switching on the computer this morning. I checked it again several times since, and it isn't working anymore: the circular progress indicator keeps going round as per the image in my previous post . [NOTE: I copied the URL that could not be found into this message and posted it but the shortened form in the posted message took me straight inside my account to my list of applications so I've come back and deleted it. cannot be found after turning off IE 11 Autocomplete and entering password into now blank box. As I mentioned in my first post, YES, a Norton tech representative took over control of my computer remotely for 3 hours last week and tried numerous things, including removing and reinstalling Norton IS twice. She was unable to correct the problem, but said that she would write it up for further review since she was not able to fix it. BTW, the "reality of the situation" is that I'm still unable to sign into my Norton Account via the Norton IS panel opened via the Norton icon in my taskbar tray. I've also noted some new strange behavior: When I go to the Identity Safe page on the web, it automatically fills in a lengthy string of "nonsense" characters for my Identity Safe password. However, I'm able to delete them and enter my correct Identity Safe password and still get into my vault via the web. This behavior is the same as others have already reported on this post. Yeah... something for sure is going on. Meanwhile, I've been without Identity Safe "autofill" on my browsers for going on two weeks now. As mentioned before, I can still sign into my vault on the Identity Safe webpage; but, when I then go to the site I want to visit, it won't of course autofill the login credentials like it would when open in my browser. To tell you the truth, I've about had it with Norton. I've been a loyal subscriber for years and years. I had Norton before Symantec even bought it, when it was owned by Peter Norton. (Yes, that's how long I've used Norton software). However, during the past few years it seems to have become increasingly "glitchy", and it seems to be very difficult to get Symantec's attention when something doesn't work correctly. The recent glitch with Identity Safe and Google Chrome was a problem that took a long time (for us users) to be resolved by Norton. Now this; and, as far as I know, Norton has not even admitted that there is a problem yet! Interesting quirk revealed on retrying and getting same failure to open Norton Account even after entering correct password -- while on the page saying it can't get to My Norton Account if I click on the refresh icon alongside the URL address box it opens my Norton Account at the list of products. 2) Able to sign-in & sign-out of ID Safe via Norton Product for ~15 min after logging into Windows, but from ~15 to 60 min after login, cannot sign in to ID Safe via Norton Product. Able to signin via Toolbar, which is reflected on the product UI. 3) when attempting to signin via the Norton Product, the "Access in process" message appears, but doesn't complete. It continues to stay "in process". Could all of those experiencing this issue send me the username (AKA email address) associated with your Norton account? Please don't post it to this board. Either send me a Private Message or send me an email (listed on my profile). Thanks. I just sent the User ID (email address) for my Norton Account to you via email. Let me know if you need passwords also. I experienced the situation where I could not sign-out of my NA using the main page NIS "Signed in as:" interface. I tested again many times yesterday (for about 10 hours while I was on line) and I had no difficulty doing wither a sign-in or a sign-out via the main UI. I have tried about 4 times this AM (online for about 2 1/2 hours and all is working fine. I am using a Local Vault for all this testing. <edit> Just switched over to Online Vault and the Sign-out/sign-in works properly via the user UI. I then closed the Onlibne Vault, signed out of my Norton Account. I then opened my Online Vault, was asked for my NA account user name, then the password, - got signed in and then asked for my Onlince Vault password and my Online Vault opened. Ths everything seesm to be working properly for me. To respond to your question, [Removed] is most definitely the email associated with my Norton Account (as my “User Name). I checked again this morning before emailing you to make sure. Then I have a password for my Norton Account, as well as a password associated with my Identity Safe account. When I signed in this morning via the web, I was able to open my Norton Account f(with [Removed] as my “User ID”) and then my Identity Safe account; so, the Norton web pages definitely recognize my login credentials. I still cannot log into my Norton Account via the Internet Security panel opened via the Norton icon in my taskbar tray, however. Maybe you’ve hit on the problem, however. Could it be that one of the Norton databases has become corrupted in some way? Could that be why I’m getting the “Failed to Login” message when I try to log into my account via the Internet Security panel? If so, would you be able to put my login credentials back into the appropriate Norton database(s) without losing my account history and my Internet Security logins? If you also need my Norton passwords for Internet Security and for Identity Safe, please let me know. OK - I managed to break it again - I no longer can signout of Norton Account via the "Signed in as:" on the min NIS GUI. I am back on the Local Vault ??? The database for the Norton Account is just one database. Your NIS accesses the same database to update the status on the main NIS screen. The problem seems to be in the communication between our NIS product page and the database at the Norton servers. Any ideas yet about how to fix the communication problem? Thanks for the heads up, Hugh - I appreciate it. After upgrade to Windows 8.1 Update 1 from MSDN I got this error too. I can't sign-in Norton Account and Norton Identity Safe on Norton Internet Security it alway show wrong password.